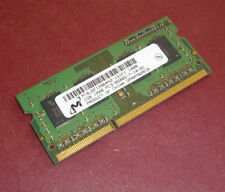 1x1GB Micron PC3-8500 1066MHz Laptop DDR3 RAM SODIMM. Working perfectly when removed from laptop. See pic for details. 6GB (6x1GB) Memory Ram Apple Mac Pro. Condition is New. Taken straight out of a Mac Pro for larger memory. HYNIX/SAMSUNG, 2GB (2X1GB), DDR3-1066MHZ. YOU GET 2-STICKS 1GB RAM. 2GB (2X1GB). TESTED BAR CODED. WHY DELAY?. TYPE/INTERFACE:240-PIN DDR3 ECC UDIMM. 168-PIN SDRAM ECC REG DIMM. 184-PIN DDR ECC DIMM KIT. 184-PIN DDR ECC REG DIMM KIT. CAS LATENCY:CL7 SPEED:PC3-8500 (1066MHz). 240-PIN DDR3 ECC DIMM KIT. 204-PIN DDR3 SODIMM. Perfect if you have a system that requires a little more speed. This kit originally cost around £100 so a real bargain to breath new life into a computer system. 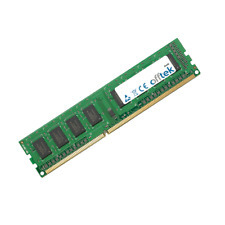 Laptop Non-ECC DDR3 Unbuffered Memory Modules Various Brands/Speeds/Capacities. 168-PIN SDRAM ECC REG DIMM. 184-PIN DDR ECC DIMM KIT. 184-PIN DDR ECC REG DIMM KIT. CAS LATENCY:CL7 SPEED: PC3-8500 (1066MHz). 240-PIN DDR3 ECC DIMM KIT. 204-PIN DDR3 SODIMM. 240-PIN DDR3 ECC REG DIMM KIT. 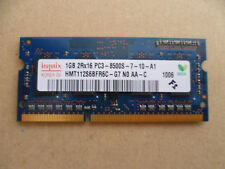 Hynix 2x 1GB (2GB) RAM. These areNOT ECC modules. Removed from Apple Mac Pro. 4 x 1GB 1Rx8 PC3-8500u-7-10 -A0 1066 Ram. Just tested and removed from Dell XPS 435mt due to upgrade.Excellent condition. CAS LATENCY:CL7 SPEED:PC3-8500 (1066MHz). 204-PIN DDR3 SODIMM. 240-PIN DDR3 DIMM. 240-PIN DDR3 ECC DIMM KIT. 240-PIN DDR3 ECC REG DIMM KIT. TYPE/INTERFACE:204-PIN DDR3 SODIMM. 4GB DDR2 400/533/667/800MHz 240-PIN ECC SERVER RAM KIT. We are only humans and all make mistakes. “Excellent quick service. “a ”. A ”. Would use again!”. “A1 Quick simple no hassle. Splendid item. 168-PIN SDRAM DIMM. 168-PIN SDRAM ECC REG DIMM. 184-PIN DDR DIMM. 184-PIN DDR ECC DIMM KIT. 184-PIN DDR ECC REG DIMM KIT. 240-PIN DDR2 DIMM. 240-PIN DDR3 DIMM. CAS LATENCY:CL7 SPEED: PC3-8500 (1066MHz). Pulled from working Mac Pro. Alternatively, complete repurposed modules may be sourced. A Hypertec Legacy Dell equivalent 1GB SODIMM (PC3-8500). Audio Visual. we do not take any responsibilty after this. Monitor & TV. Component for Notebook. This was removed from a working laptop and has been tested and works fine. APPLE Xserve (2009) Single-core (2.26GHz) / Dual-core (2.26GHz, 2.66GHz) / Quad-core (2.93GHz). 168-PIN SDRAM ECC REG DIMM. 184-PIN DDR ECC DIMM KIT. 184-PIN DDR ECC REG DIMM KIT. CAS LATENCY:CL7 SPEED:PC3-8500 (1066MHz). Kingston's testing process combines Low-profile DIMM for Lenovo PC or other. Capacity: 1GB (1x1GB Stick). RAM Type: DDR3 DIMM. Geil GN32GB1066C7SN. Bus SpeedPC3-8500 (DDR3 1066MHz). Form FactorDDR3 DIMM 240-Pin. Ci Enterprise 4094. Fits the following models. 2 RAMBO DDR3-1066 CL8 (1GB DDR3 PC3-8500 1066MHz SODIMM 204-pin) DRAM - V.
2 / Matched Pair. See Invoice. Net Weight 150g. We Accept Only. Ending Soon. New Arrivals. QUICK LINKS. we do not take any responsibilty after this. you can buy in set of 6 max. Why Choose Us! This is identical, only difference being the serial info on label on lower right. SAMSUNG 1GB NOTEBOOK SODIMM DDR3 PC8500(1066). · Goods are usually dispatched within 24 hours (except weekends). Type DDR3 SDRAM. Capacity per Module 1GB. Good Condition. Also visually inspected for defects. Actual product may vary in appearance from photo. Capacity (RAM) 1GB. If possible, include photos or video to assist in understanding the problem. 2x Hynix 1GB DDR3 RAM Memory Module PC3 8500S HMT112S6BFR6C. Condition is Used. Dispatched with Royal Mail 1st Class Large Letter. Samsung . Removed from working 15" MacbookPro. Micron .